@Cheese - What are we looking at here? One image shows two black receptacles, side by side; one with a matte finish and one with a glossy finish. Another image shows the front face of the SYS-PH with the matte receptacles installed. According to the embossing/molding on the spring loaded cover that's mounted to the glossy receptacle, it is rated IP54. Are the glossy receptacles that ones that came preinstalled in the SYS-PH and the matte receptacles the 5-15 110V ones that you refitted? If so, aren't both versions rated IP54? If not, what am I missing? @Cheese - If not, what am I missing? You’re not missing anything this is all on me. I saw some photos of the Festool receptacle a few years back and they had IP 44 marked on them. When I opened this SYS-PowerHub up it’s also marked IP 44 so I assumed they were using the same receptacles. I just yanked the Euro receptacles and replaced them with the US version and then took the pictures. Nice to know they’re now IP 54. The US receptacle is on the left with the rubber gasket directly above it, the Euro’s are on the right. Thanks  for noting the error. Well I received the receptacles yesterday so I decided to install them. Pretty simple install once you figure out how to remove the wires from the existing receptacles. 1. A charger for the CXS fits nicely inside along with a battery and the lid closes completely. 2. A USB charger also fits inside to maintain the phone charge. 3. The new receptacles are IP 54 rated versus the originals which are IP 44. 4. The new receptacles include a rubber gasket which is probably the reason for the enhanced rating. Nice I like the black outlets. Bah! I dislike all of you. Every last one. I presume that you will not be plugging the CT into the power sys as well because that by itself will max out the unit. Correcto...my first defense will be to plug the CT directly into the outlet, I’ll use the PowerHub as an expensive power cord. I like that because I have several older Festool tools that do not have plug-it cords and I need to use several of them intermittently. ...in my 120V DIY version (along the lines of what is included in the wiring of an actual SYS-PH). Any thoughts on the suggested specs for such a device? They seem to be rated by temperature and most I'm looking at are "normal-close" (which, I'm assuming, means that in the absence of power the switch opens, thus breaking the circuit). Expected loads are those produced by a TS 75, an OF 1400 and other common 120V powered hand tools. What temp rating should I seek? These types of devices don't seem to be rated by temperature but instead appear to be rated only by voltage and amperage. I assume, then, that I'd simply need a switch rated for 120V and 15A (as opposed to some other spec that I am unclear about)? Cost for the former is about twice that of the latter which leads me to believe that perhaps the thermal cutout is a more durable device. But, again, I'm just guessing. The thermal overload switch has to be attached to the device that it is protecting. When the device gets hot it switches off and when it cools it switches back on. The resetable thermal circuit breaker gets hot when the current thru it reaches it's rated value and then it switches off until you reset it. The second one is the one that you want. @Bohdan - Huh. Then I wonder why Festool opts for the non-resettable kind? It would seem that being able to simply reset a breaker (versus having to wait around for something to cool down) would be ideal. Maybe the Euro-regulations require that kind of overload device (and don't allow the resettable kind)? From the looks of the pics of the power box Festool actually use a resetable one as nothing would have gotten hot. The non resetable type is used when the tool has to cool down from overheating so that it doesn't let out the magic smoke such as in the TS55. If they had one in the Kapex there wouldn't a regular requirement for new armatures. Just a question to those that have done the mod. Are you replacing the builtin thermal cutout because at 240v the sys can supply 2500w but at 120v this will drop to 1250w before the overload pops. An interesting point as this is the label inside the PowerHub. Look at the coiled vs uncoiled rating. I’d like to understand this better or explore it further. Not an expert but have some electrical experience. My understanding is the power (watts) will remain essentially constant at 240V vs 120V, only the amperage will vary. I believe a given Festool will draw some number of watts - whether it’s running on 120 or 240V. If the thermal cutout is based on watts (this part I’m not sure of) won’t it be exactly the same - the wattage draw is constant, just the combination of current and voltage will vary? If so won’t the thermal cutoff be the same? Or I’m missing something. For those who have done the mod, what can you realistically plug in vs. not? I’d like to figure out real-world usage before jumping in myself. 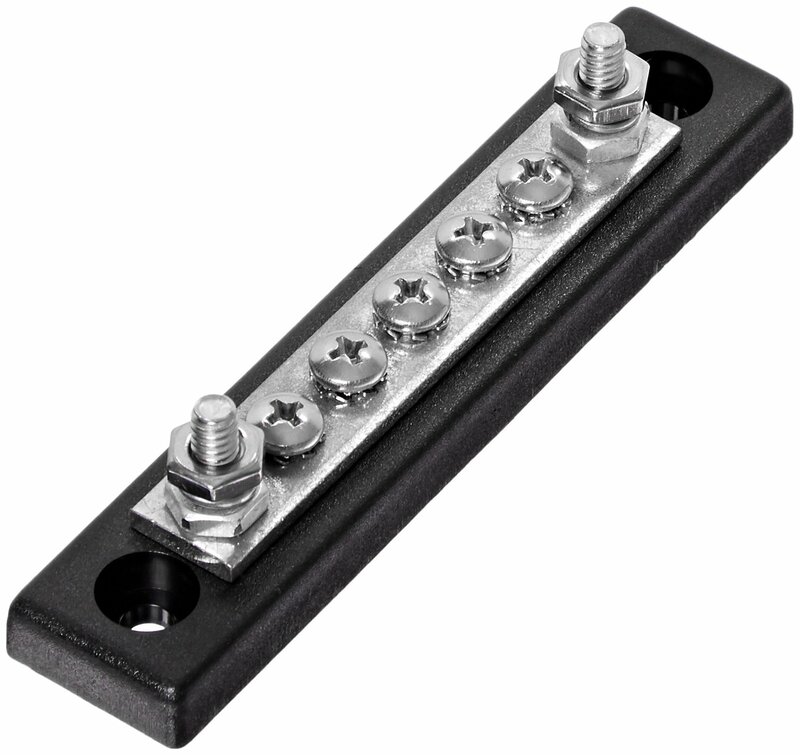 So, in putting together a parts list for my 'DIY-sys-ph', I'm encountering difficulty finding what I would refer to as "busbars". I know that I could simply wire everything together with wire nuts and a rat's nest of wire but I like the clean look produced by a bus bar. Moreover, given the knocks and vibration a power distribution tool box would be subjected to, it just makes sense to follow the kinds of electrical connection practices that are employed in the stock SYS-PH. Therefore, I figure I will either need one bus bar capable or handling all three functions (hot, neutral, ground) or three, one each for the hot, the neutral and the ground. Whatever it/they would look like, it/they would need to permit an adequate number of connection points for five outlets and an indicator light). Pretty simple - the hot, neutral and ground wires plug into one end and take-offs emerge when necessary from the relevant bar to attach each outlet to the busbar. The trouble is that no amount of searching produces anything that looks like it would be appropriate for a 120V 15A AC system. ...and other less-beefy versions for automotive use as well as busbars intended for residential (though low-voltage) uses - like this one - but I can't find anything that looks remotely like the busbar in the SYS-PH nor anything at all that looks like it would work for spreading ~1600W-2200W loads across five NEMA 5-15 outlets and a small 120V LED indicator light. At this point, I'm thinking that I am not using the proper terminology in my searches. Just a heads up. This thread is likely going to be be split. The original part of the thread was about taking a systainer - a plastic box - and then adding off the shelf electrical components. The second part of the thread is about modifying a Festool electrical product. FWIW Peter, if you split this thread, consider naming one thread SYS-PowerHub and the other one Sys Power Box to differentiate between the actual Festool product and a home grown product. So, in putting together a parts list for my 'DIY-sys-ph', I'm encountering difficulty finding what I would refer to as "busbars". Keep it simple...lever nuts. 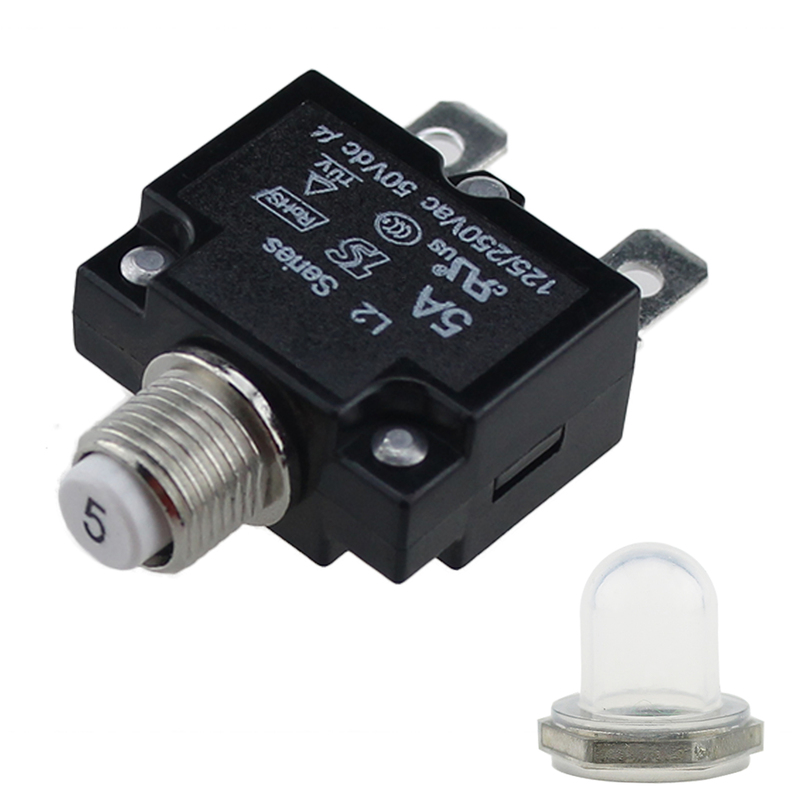 Rated voltage - 400, rated current 32A. They’re all I use now b/c they enable easy unit serviceability in the future and the wires won’t shake loose. Good call on the Wago connectors, easier and safer than anything else. Too bad they don't come in a 6-wire model for this application. However, a 5-wire and 3-wire used together would work. These can also be mounted on a DIN rail using their mounting carrier. Just ran across the new version of the older 222 connector, now known as the 221 connector. These should be easier to use than the 222 series because the push down lever is a lot larger. Which brings up an alternative for this application. I use 6-wire Wago Wall Nuts for outdoor lighting. I use standard 14 ga outdoor wire which is stranded. I just tin the ends and insert it into the Wago connectors. These are available for up to 8-wires and can also be mounted on a DIN rail. @Scorpion & @Cheese - Thanks so much for the advice! Having recently emerged from the rabbit hole of learning from scratch about DIN rails and terminal blocks (oh my! ), I now feel a little more equipped to move ahead with my DIY-sys-power-box. Although I now understand that I could assemble three busbars using sets of single-layer, 2-pole terminal blocks connected by jumpers, I'll stick with the even simpler method (that you so thoughtfully suggested) of using three 8-conductor Wall Nuts, the combination of which will provide me with a total of 24 positions (a.k.a "connection points"). 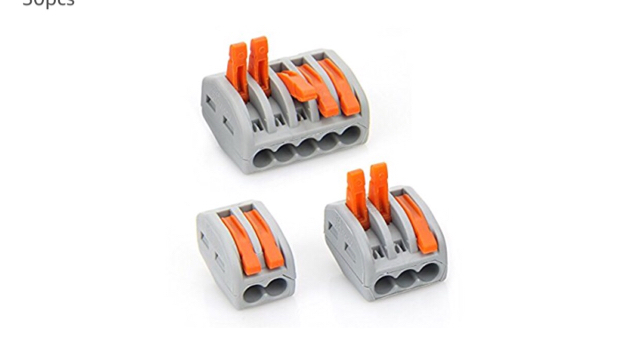 Since one position per "Wall Nut" will be occupied by the respective line wire (hot, neutral or ground) this will leave seven positions free and available for connecting the various wires that will attach the outlets, the indicator light and the thermal cutoff. After everything is connected, I'll be left with one free position on each of the hot and neutral Wall Nuts and two open positions on the ground Wall Nut (in each case, just enough for future expansion possibilities). While I'd have preferred Lever Nuts (easier to remove wires once installed should that ever become necessary) I was put off by the need to install jumper wires between the three sets of 5-conductor and 3-conductor Lever Nuts (as you no doubt understood, I'd need to combine them in this manner in order to achieve enough open positions for the number of wires I'll be working with. So, needlessly complex. Also, for a more stable build, I will purchase a 12" length of 35mm aluminum DIN rail, two Wago screwless DIN rail end stops and two Wago Fixing Carriers (the latter of which will allow the Wall Nuts to snap onto the DIN rail). I'll fasten an appropriate length of DIN rail to the floor of the systainer (using pop rivets and washers or maybe I'll glue a piece of plywood to the floor and use screws to mount the DIN rail to it). Either way, I like the idea of using Wall Nuts as impromptu (and inexpensive!) busbars and am very appreciative to have been pointed in their direction. In the end, total build cost will be US$10.23 (basically the cost of the order from Newark). I challenge anyone to do it for less! This thread started out as a DIY project using a Systainer and then installing electrical items. Later it turned into a thread about about modifying a Festool Sys-Hub. The policy of the forum is to not allow posts about modifying Festool products. There may appear to be gaps in the thread above. Unfortunately some posts have been removed. PLEASE do not post about electrically modifying Festool products. The forum guidelines allow descretion for the evaluation of posts. You can certainly review them. Modifying Festools electrically and then posting here would be an excellent example of what ANY manufacturer would not want on their own forum. As a follow up to my last post, I specified electrically modifying because this was a thread that was talking about just that. How about a previous post where a member modified a Festool router to add LED lighting to it, would that also be a no no? The rules are clear but clearly not enforced in all situations. I’m a grown man and fully understand the consequences of modifying tools and equipment. In this case we’ve discussed replacing outlets with OEM replacement parts and doing so would require nothing more than basic electrical skills similar to what’s necessary to add the second plug to a dust collector (which Festool willingly sells to me) or change out a factory plug on a non-Festool with a plugIt connector (I have 10). I will concede but I do so in protest. I’m a rule follower but this one feels like it’s landing on the wrong side of the line. Edit: it’s so simple I think Festool should sell a conversion kit BTW. Did you ever build this project with the DIN rail. If so it would be fun to see a picture or two of the finished product. I'm currently traveling but fully intend to post detailed project notes upon my return (July'ish). All of the individual components are at home, just waiting to be assembled. FWIW I do my best planning away from home when I have the time to spend researching and mentally designing. Stay tuned! Great thread here! I have been looking at options for power distribution at a rolling stack that could include chargers as well. @Cheese You mentioned that you were going to put your CSX charger in the empty space of your box. Do you have a pic of that? I am curious how much space is left for another charger. I have a Milwaukee M12 charger I would also add in the box if it would fit. The conversion looks like a winner! Great job guys! A systainer of bits and bytes.